Boo Boo and Baby Puppy. Boo Boo is the household cat, a fine white specimen with orange spots like the one on his nose. 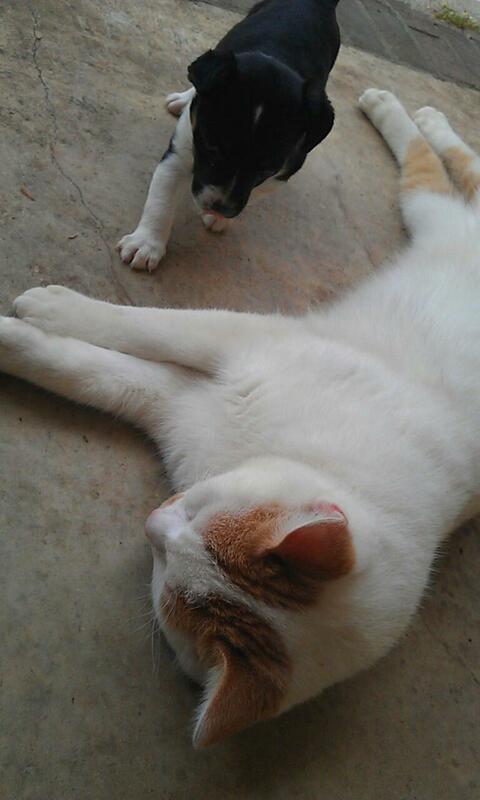 He arrived at our door quite young and was soon joined by Squirt, a feisty brown-haired puppy who was also quite young. These events occurred over Christmastime. My niece got them as pets for her two-year-old daughter, who loved on them a great deal, you can be sure. They were housed on the back porch in a single dwelling furnished with ample blankets and soft toys to chew on. Kitten and puppy spent many cold nights huddling together in their house as winter gave way grudgingly to spring. They are protected from the other family dogs by a fence. They are small enough to sneak under the fence and explore, but the other dogs are too big to do so. It was a joy to watch them play together as they both grew in size. They seemed quite evenly matched. When Squirt became too aggressive and feisty his pal Boo Boo jumped up on a chair or the play slide to escape, leaving Squirt quite frustrated by his short legs. Boo Boo had tricks up his sleeve that did not require brute strength. While Squirt soon discovered the hole under the fence and made peace with the other dogs, Boo Boo wisely remained inside the fence. One of the other dogs, Scotty, would be happy to eat him alive, and Boo Boo knows it. Recently Squirt went on an unfortunate escapade to a neighbor's house. He apparently got into some poison set out for mice and rats. He came home throwing up something awful, and died very soon afterward, leaving his friend Boo Boo alone in the backyard. On the day Squirt was buried, the gate to the backyard fence was left open and Scotty rambled through it, making a beeline for Boo Boo, who promptly ran up a tree and remained there until we could persuade Scotty to move along. These events reminded me quite powerfully that bigotry is a learned behavior. Boo Boo and Squirt were as different as two friends could hope to be. Yet, raised together as they were, they saw each other as friends and they enjoyed their friendship. They ate together, played together, slept together, seemingly unaware that one was a dog and the other was a cat. According to the "natural order of things," they should have been enemies. They should have hated each other. But they did not see themselves in that light. Even after Squirt made the acquaintance of Scotty and the others, he returned to his home on the back porch with Boo Boo and they carried on just the same, their friendship undisturbed by whatever Squirt might have learned at the paws of his elders. While I was busy anthropomorphising the pets, an opportunity came along to test my conclusions. Not quite knowing what to tell her two-year-old daughter about the demise of Squirt, my niece promptly got another puppy and put him under Boo Boo's care in the backyard. Boo Boo is an old hand now at raising puppies, and he has taken to Baby Puppy quite naturally. Baby Puppy has learned that the large white creature stalking around the back porch is friendly and will not hurt him, and so this particular circle of life will go on. The old fellows on the other side of the fence stare through its chain links disapprovingly, of course. Perhaps they are concerned about the welfare of Baby Puppy being raised in such an unnatural state. Perhaps they are biding their time and waiting for an opportunity to teach Boo Boo a thing or two about How Things Are. Or perhaps they're just bored and have nothing better to do. What they don't understand is that a force larger than themselves in is in control of the situation. Human hands put up that fence that separates them. Human hands feed all of them, without fear or favor. Human hands watch out for those times when the gate is left open, ready to intervene if things get out of hand. They have their own ways of doing things, but there is a greater intelligence out there that sees far more than they do, an intelligence that watches out for the Boo Boos of the world, an intelligence that has its own opinions on How Things Are. Long live Boo Boo the Magnificent. You will not find a finer cat in these parts. And may Squirt rest in peace.